I'd like to send an email once a month to a list of email addresses with personalised message. I cannot figure out how to do that. Let me elaborate. I have a bunch of domains and most of them have some address like info@domain.com set up with forwarding to my main email address. Every now and then it turns out that somebody has been sending me email to one of those addresses but it didn't get through to me. So, I'd like a service to send me an email to every one of those addresses once a month so I can detect if an address does not work. I tried zappier (send email once a month), but it sends a single email with all of the addresses in "To:" field and identical text, so I cannot figure out which email address died and which are alive. 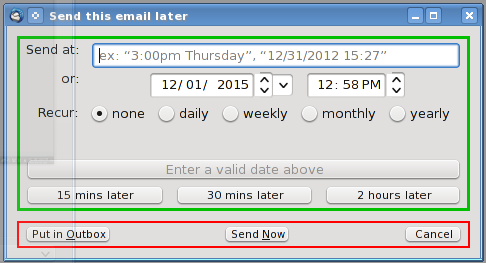 If I create a separate zap for each email, I will break the 5-zaps free account limit. I tried using nudgemail, but I have to be able to send email from the address to which I wish the email to be sent, and most of the email addresses in question are just forwarders to my main email address, so that's not possible. I could, of course, write a simple python script and put it on a server with a cron job, but then I have to pay for a server just for that... aaaaand, I'm out of ideas. If I do not figure this out soon, I'll go with the python script solution, but I'd really like to find a free service which would allow me to do this, so I can simply forget about it. Your question asks for a service recommendation. However, you can do this without one. This may be a feature available in your email app. I don't know if gmail includes it, but you could access your account through a POP3 email app, like Thunderbird (which is free). It has an available Send Later add-on that can send a recurring message. Is there such a thing as a SAAS Bulk Emailer? Email marketing service without “unsubscribe” link requirement?